Diligent, discerning and attractively pompous Ashanthi is on concert tours to London, Goa and Bombay, with her team of star performers of course, the duo, Bhatiya and Santhush and the rap chap Randhir. Ashanthi has toured Europe, the Mediterranean, North America Australasia, the Middle East, and most of the countries in the Asian subcontinent during the last couple of years. The diva has stunned audiences across the world with her high-powered singing and magnetic personality. She won the "Most Promising Female Singer" award at the Shanghai Asia Music Festival, 2002 for her first single "Out of the Blue." Ashanthi is the only female artist in the country to have signed a contract with an international record label, Sony BMG. With her debut album, Oba Magemai, Ashanthi became a central figure in the Sri Lankan music field with a special note winning the Sunday Observer Golden Clef Award for Song of the Year in 2003 for her single, "Angel". The artist plans to release a new album in the next few months, which will comprise 14 original tracks in the styles of Hip-hop, R & B, Jazz, Bhangra and Baila. The following is an exclusive interview with Ashanthi by In Tune, carried out just a few hours ago before she caught her flight and left the country on her concert tour to London, Goa and Bombay. I interviewed Ashanthi on her music, professional career and on herself. Bhatiya has described you as the Queen of Hip Hop in Sri Lanka in a number of occasions on live performances and on some video clips telecast on TV. Do you consider yourself as a Hip Hop artist? I consider myself as a vocalist. Anyway I am more or less an R & B and a Soul singer if you like. Hip-hop is an extension of these two music genres. Tell us about your current tour. It's a tour sponsored by SriLankan Airlines and the Tourist Board. The tour has been organised with a focus to promote tourism in Sri Lanka. Have you got anything to say about your recent track record with "Sandawathuren" under Sony BMG and M Entertainment labels? I think Sandawathuren is a much better record. Everyone likes the song. I want the Sandawathuren album, which I'm planning to release shortly to become something like someone's favourite T-shirt. The album is a fusion of the newest sounds with hip hop, R & B and pop ballads. With Bathiya Jayakody, Mahesh Denipitiya, the Ranganathan brothers are behind the mixing desk, the album's prospects look promising. There will be 14 tracks including two English songs. Eranga Jayawansa is making beats and SFX album. Other artists featured in the album will be Bertrum Charles on vocals, Randhir on rap and lyrics, Redrum on Rap, Nawaratna Gamage on melody compositions , Nuwan on flute, Ruwan Weerasekera, Jananath Warakagoda on percussion and Dave Collins on Sax. The English lyrics were done by me. The songs were written by Nilar Cassim, Vasantha Dukgannarala, and late Hemasiri Halpita. This will be Sri Lanka's first ever female R&B album. 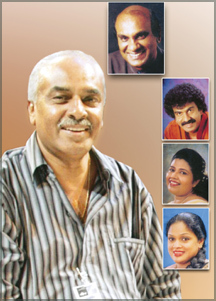 'Susara Gee Rawe, Rohana Ransara Geethavaliya,' a musical evening organised to mark 35 years of music composing career of Rohana Weerasinghe, the true Sri Lankan music legend who has made a name, locally and internationally, will be staged on November 4 at 6.30 p.m. at the National Youth Council Auditorium, Maharagama. The top most artistes Sunil Edirisinghe, Edward Jayakody, Deepika Priyadharshani and Charitha Priyadharshani Peiris will also perform at this musical evening. This would bring wide range of top songs composed by Rohana Weerasinghe. This special evening would be his first performance after being performed at the world-renowned 'Sydney Opera House' which added glitter and glamour to his illustrious career. The 'Araliya Group' of the Past Pupils Association organised this special event to mark the 35 years of music composing career of Rohana Weerasinghe who bestowed pride to his Alma Mater - Dharmapala Vidyalaya, Pannipitiya. The proceeds of the show will be utilised for the development project of the school. This is the fourth time the Past Pupils Association organised 'Susara Gee Rawe' and at the last occasion, the show presented in a very innovative manner by two top-most legends of Sinhala music Sunil and Rohana, which was an historical event. It was one of the best shows they performed. And no dought Rohana's 'Ransara Geethavaliya' will hold the audience spellbound. VSA Arts is seeking submissions from young musicians of all styles for its 2007 International Young Soloists Award. A committee of distinguished music professionals will select the award recipients to receive monetary awards and the opportunity to perform in Washington, DC. Applicants from the US must be 25 and under or 30 and under if from outside of the US. Deadlines for submission: December 1, 2006 (US) and December 15, 2006 (outside the US). All applicants must have a disability. The VSA arts International Young Soloists Award annually recognises outstanding young musicians with disabilities and supports and encourages them in their pursuit of a career. For additional information, application, and guidelines visit www.vsarts.org or call 800-933-8721 or +1-202-628-2800. VSA arts is an international nonprofit organisation founded in 1974 by Ambassador Jean Kennedy Smith to create a society where all people with disabilities learn through, participate in and enjoy the arts. VSA arts provides educators, parents, and artists with resources and the tools to support arts programming in schools and communities.